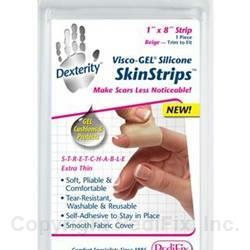 Extra thin, medical grade silicone strips soften and smooth scar tissue. They help improve color, texture and thickness to make scars less noticeable. SkinStrips™ cushion and protect, and relieve itching and pain. Washable and reusable for repeated applications. Scissor-trim for perfect fit. Self-adhesive to stay in place. 1 per pack. Wash and dry affected area. Cut sheet to desired size and shape. Remove backing and apply. Hand wash. Air dry completely before reuse. Gel retains its self-adhesive properties after washing and fully drying. Store in original packaging when not in use. If you have diabetes or poor circulation, consult your physician before use. If numbness, discoloration, irritation or additional pain occurs, discontinue use. Do not use directly on blisters or open wounds. If symptoms persist, visit your doctor.